The Oklahoma City Zoo is offering Free admission Monday. 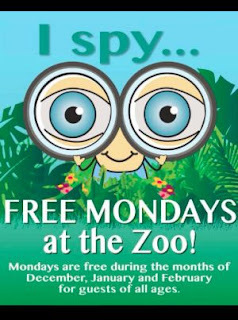 Admission is free every Monday in December 2012, January 2013 through February 2013 all ages. The Zoo opens at 9 a.m. Closes at 5 p.m., everyday. The Exhibit buildings close at 4:45 p.m. The only days that the Zoo is closed are on Thanksgiving, Christmas and New Year's days. The Oklahoma City Zoo has something for everyone. They have Apes, Monkeys, Reptiles, Birds, Fish, Coyotes, Deer, Alligators, Giraffes, Elephants, even a Baby Elephant and many more beautiful animals to enjoy visiting. If you have not been to the Zoo Mondays would be a great time to take the family in the next few months while admission is free. There are a lot of great things to do at the Zoo check their web site for further information.